Glenwood Springs Health Care specializes in effective post-acute care that strives to get residents back to the active lives they once knew. Our facility uses specialized medical and rehabilitation technology along with advanced staff training in complex care conditions to provide an overall approach to wellness. Our fully credentialed nursing staff provide 24/7 care to the residents, assuring that each resident is cared for when it comes to their medical needs. We provide a wide range of skilled services for patients in need of diabetes management, ileostomy care, tube feeding, wound care, IV therapy, and much more. You can rest assured knowing your needs will be met by our dedicated staff available at the touch of a button 24/7. Our nursing team is committed to providing consistent, compassionate care to you or your loved one. Our staff provides loving care to each resident with his or her needs in daily living, accommodating a decline in areas such as eating, bathing, toileting, & transferring. 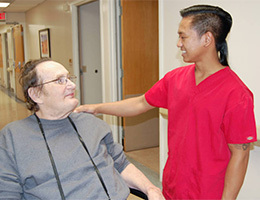 A dental provider evaluates each resident at the facility on a monthly basis to ensure healthy oral hygiene. Social services provide essential information, manages requests and concerns, coordinates appointments, maintains contact and open communication between the facility, families and the residents, and helps in care planning and discharge planning for each resident. Our team is ready to arrange professional services for all our residents. Our on-site chef provides residents with specific dietary and physician-ordered meals with great passion. Always striving for resident satisfaction, our chef provides a variety of meal options that don’t lack on flavor or nutrition.